What better reason to get a tattoo than to commemorate such a life alternating event as the birth of a child? Having your baby's tiny digits inked on your body can be a wonderful reminder of your commitment to love, protect and provide for this new life. It's also a way to celebrate the bonds of the child/parent connection. There are many ways to design baby footprint tattoos. The design you use should be meaningful to you and appeal to your own personal style. Some ideas to consider include the following. Every new baby is footprinted at the hospital shortly after birth. Parents receive a copy of the print for identification purposes as well as for a keepsake of the event. Typically done in plain black ink, these certificates make an ideal blueprint for a baby foot tat. A talented artist can take that original print, copy it onto transfer paper and use it as the basis for an awe-inspiring tattoo. Many pro-life proponents use two tiny baby feet to symbolize the size of a fetus's feet at the time of the legal gestational age limit on abortions. They feel this shows that a baby is a real human life, and not a conglomeration of impersonal cells. To them, a baby foot tat can be a very powerful symbol. Should you use one or two feet in your design? It's really your choice, and it depends on what else you might like to incorporate in the design and where you want to locate your new tat. The amount of footprints you use can also impact the overall size of your tattoo. A unique design that can be added to whenever a new child is born is to start between the shoulder blades or at the top of the back of one shoulder. Add just one footprint from the current baby and the child's name. Add each new baby's print and name as it is born. You'll wind up with a trail of little feet that symbolize your family. Alternating between left and right foot tattoos creates a trail of foot steps, something that can also be symbolic of your life's journey. There really is no reason to limit yourself strictly to black ink. Feel free to use colors to make your tat pop. Consider pink or baby blue to designate between a girl or a boy. You might even choose to use rainbow colors for a more impressive visual. Unfortunately, the joys of a new birth can be marred by an untimely death. Baby footprint tattoos can be used to memorialize a life that had barely begun. In cases like this, you can still have the baby foot-printed and use the prints to create a very personal tattoo. Other items to include would be the child's name and the dates of the birth and death. The end result is a tat that pays a beautiful tribute to the lost child. Footprint tattoos can be very simple works. However, there are many ways to expand on the design. Birth information such as the date and time of birth, weight, length, etc. 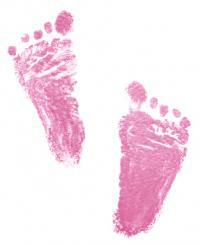 A single newborn's life-sized footprint can be tattooed on top of an adult's foot to show the difference in size. This can make a very tender tattoo that a child will appreciate looking at in the years to come. A set of life-sized baby feet need a bit of space, but there's no reason they need to be placed side by side. If spaced in a walking pattern, they should fit nicely on an upper arm or leg. Larger designs that contain additional elements might be better placed as a chest, back or upper shoulder tattoo. Tattoos are a great way to make a tribute to an important milestone in your life. What better way to permanently symbolize the birth of your child than with a footprint tattoo? This type of tattoo can be a one-of-a-kind design that will remind you of your child each time you look at it.